Cable pusher is used for installation and pulling cable on the ground. It is electric driven, with even speed and pulling force. 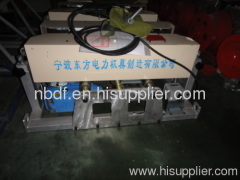 The electric motor driven cable pushers are used for installation of big power cable in even speed. The rubber caterpillar of cable pusher. Group of Underground Cable Pusher has been presented above, want more	Underground Cable Pusher and Underground installation Cable pusher , Please Contact Us.